Sometimes external LED light setups on your fish tank just don’t cut it. For times like those, you need some underwater lights. Underwater LEDs are a great way to liven up your tank. There are spotlight varieties that you can use to highlight your most interesting tank features, like a particularly gorgeous piece of coral. There are bar lights, that can stick to the sides or rest on the bottom of your tank. And there are even lights that, when submerged, create a screen of air bubbles to add extra movement and a pop of color to your tank. Underwater LED lights aren’t the best for growing plants. But if you want to bring the party to your fish tank, submerged lights can be an inexpensive way to do just that! 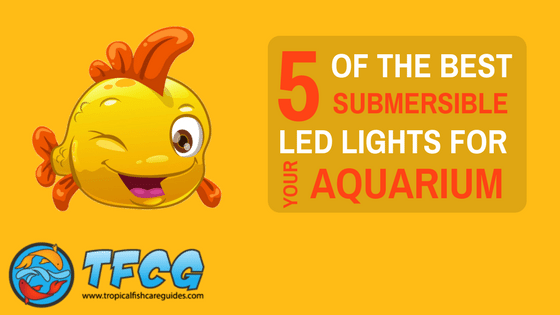 This list looks at 5 of the best submersible LED lights for aquariums that are currently available. The Mingdak LED underwater aquarium light is a fully submersible fixture that features crystal glass lights. You can get this fixture, which is 14.5 inches, on Amazon. It’s suitable for both freshwater and saltwater aquariums. If you’re looking for a way to liven up your night time tank viewing, this Mingdak fixture is a good option. According to Amazon, this fixture features adjustable legs that can accommodate 16-22 inch aquariums. If you’re going to have this unit submerged in your tank, you’ll be using the suction cups that come with this unit. Some customers have complained that the suction cups aren’t as strong as they’d like. This underwater LED aquarium light is a great option if you’re looking for a highly-customizable lighting aesthetic. The light has a sleek design, so it won’t be too much of an eyesore submerged in your tank. It comes with a wireless remote. This remote controls brightness, colors, color transitions, and the on/off switch. If you’re looking for an attractive, customizable, inexpensive underwater light, check out the Mingdak LED submersible crystal glass lights. As its name suggests, the Fluval Prism LED spotlight isn’t a barlight, as most LEDs are. It’s actually a spotlight designed to be submerged in your tank. It is compatible with both freshwater and saltwater tanks. The spotlight has some good range on it, with Fluval alleging it can penetrate about six feet. This underwater spotlight boasts impressive color options–you’ll be able to create up to 80 unique lighting options (this includes special effects). It includes RGB lights, and these colors can be controlled individually (hence all the possible color combinations). Rather than the typical plastic frames for underwater lights, this Fluval Spotlight is made with a ceramic layer. This should provide extra durability and quality. The spotlight is a neat idea because you can use it to highlight certain features in your tank. If you have a really neat fish or patch of coral, why not show it off? The customizable colors gives you access to the best aesthetic options. If some extra green light makes your plants pop, set that as your submerged spotlight’s color. If you have a nocturnal fish that makes surprise appearances in red light, set that as the spotlight’s color. The versatility of this light make it a cool pickup. The IP68 Amphibious LED Aquarium Spotlight is a very inexpensive light designed for underwater use in your fish tank. The IP68 in the title actually refers to American waterproofing standards–IP68 is the highest. An IP68 rating on a device like a cellphone means the unit could be submerged a few feet in water for up to thirty minutes without sustaining any corrosion or water damage. Obviously your underwater spotlight will be submerged longer than 30 minutes–but the fact that it’s a simple LED light, and not an advanced piece of technology like a cellphone, makes a difference here. There are no complaints on Amazon about this light (to be fair, there are only 4 customer reviews, all of them giving great reviews). The spotlight has a convex lens design, meaning it is “twice as bright as ordinary lights.” It has a silicone suction cup. The fixture is plastic, and the angle of the light can be adjusted, which makes setup a bit easier. The Xcellent Global Underwater LED air bubble light fixture is 18 inches, and features RGB LEDs. The included RGBs create 7 different color options. The light changes colors automatically. If you’re looking for color options and high levels of customization, you’ll want to opt out of this fixture. Or, if you want the bubbles and a little more color customization, you could supplement this light with the Fluval spotlight. The aesthetic additions of this LED fixture don’t end with the lights. This fixture is unique because it features an air bubble system. The fixture must be fully submerged in order for the air bubbles to work. Even then, some customers have reported that only half of their air bubble vents work. This fixture produces a screen of air bubbles that catch the light, making for a very neat effect. An air pump is not included. The housing for this fixture is a little bit thicker than other designs. But the housing is black and unobtrusive. Some customers had trouble getting the suction cups to work well. And, as we mentioned, some customers had issues with their air bubbles. This problem could stem from their tubing, which might not have supplied the right kind of air flow to get all the bubble vents blowing. The Amzdeal Underwater Aquarium LED blue light fixture can survive in and out of water. To be clear, the light bar can be submerged, the power adaptor cannot. The light bar ise 11 inches long, and has 10 blue LED lights. This unit doesn’t have any white light–it’s all blue LEDs. The fixture comes with the standard dual suction cups, so you can secure it to the sides, the bottom, or the top of your tank. The sides of the light bar are capped in black, but the bar itself is silver in color, with a slim design. It works for both freshwater and saltwater tanks. The majority of Amazon customer reviews are favorable, with many customers being highly satisfied. Some of the customer complaints come from misreading the description–the light is blue and does not change colors. Some people missed that before ordering. Other customers complain about the lack of an on/off switch. The light is energy efficient at 3.7 watts, and generates very little heat. Based on the reviews, customers have used this light happily in 10 gallon tanks all the way up to 55 gallon tanks.